The blog post that might have saved my baby’s life | "Keep Running Mummy!" I find that insane that your NHS doesn’t do that. Here in the United States, every woman is tested for it because of the seriousness of it. I’m so glad your baby was ok and so sad for those who weren’t. You can request both a urine and swab test for GBS, GP can do both at any stage during pregnancy, there is no charge. The problem of course is awareness; if the vast majority of the population don’t know about it GBS then they won’t know to be tested, with potentially tragic outcomes. I read about it in a magazine. When I went for my check up, I wanted to ask my gynae to test me. It turns out I was already in labour and I was admitted. 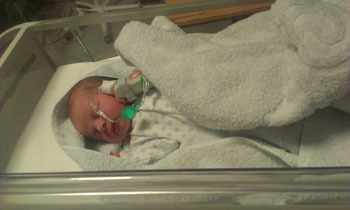 I was 32 weeks pregnant, they stopped managed to stop the labour. But due to stress and anxiety of not being ready for the arrival of my baby, I couldn’t ask my gynae for the test. I had completely forgotten. My baby was born at 38 weeks. Everything was fine until he had to be discharged. The paediatrician rushed him to the NICU because he had an infection. 2 days later, we learnt that our baby had GBS. He spent 35 days in the NICU. This is something that could have been prevented but anxiety got the best of me. He is now lying on my chest. Every day I look at him and smile. It was a rough journey, especially when we consider the fact that upon admission, he flatlined. His heart stopped and he stopped breathing as well. He was on the breathing machine for a week. I was fortunate because I gave birth at a private hospital and I stayed longer. The infection was caught right on time.